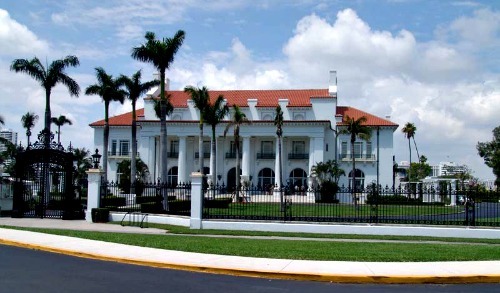 Is The Flagler Mansion Haunted? The Flagler mansion, also known as Whitehall, was built by one of the founders of Standard Oil named Henry Flagler for his third wife. Construction began in July of 1900 and was completed on 6th February 1902. The home was presented to his wife, Mary Lily as a wedding present, though the couple were so insanely rich it was only used as a winter residence, with the couple travelling there from their other homes in one of several private rail cars. Henry Flagler died at the age of 83 from injuries sustained from falling down a marble staircase in 1913, with his wife passing away 4 years later. The property was passed to their niece, Louise Clisby Wise Lewis who immediately sold the property to investors. These investors added a 300 room, 10 Storey addition to the west side of the building, as well as removing some of the original rooms such as Mr Flaglers offices and the housekeepers apartment, as well as major changes to the kitchen and pantry. The site was due to be demolished in 1959 but was saved by one of Henrys granddaughters who started the Henry Morrison Flagler Museum non profit corporation. They purchased the building and it opened as a museum the next year. In 1963 the 10 Storey addition was demolished as part of the preparations of opening it to the public. Today it is registered as a National Historic Landmark and remains open to the public, offering tours and hosting functions such as weddings and exhibits. The number of ghosts that haunt the mansion is thought to be few, but they certainly like to make their presence known to unsuspecting visitors. As you may have guessed the main ghostly occupant of the house is that of Henry Flagler himself, who died from injuries received from falling down one of the marble stair cases in the home, though his actual place of death was the local hospital. There are many stories about how he likes to make himself known, with the common reports of his presence coming from the area which used to be his offices. He was known to spend huge amounts of time in his office and it seems even after his death he's not prepared to let it go. Tales of his apparition being seen in the room along with stories of the lights dimming on their own, as if they were not receiving enough electricity. Foot steps from corridors and rooms known to be empty are amongst the other reports of this place, and orbs can often be captured throughout, especially in the dining room and kitchen.